I just posted this on ZenKimchi. It occurred while we were broadcasting our morning show live. 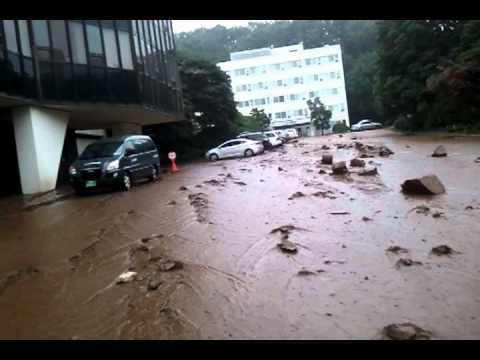 At around 8:40 a.m. Korean Standard Time a landslide it the EBS studios in Umyeon-dong in Seoul on Wednesday. The studio was evacuated and no one was injured. Water and mud flowed through the building and down the street, uprooting trees, washing down concrete blocks and damaging cars. Residents are working together in clearing debris and removing storm drain grates. It hit in the middle of broadcasting “Morning Special” on EBS FM. A rumble was felt in the studio and was assumed to be thunder. A few minutes later, a call came in from the news anchor Peter Binn, who had just left the studio, that a landslide had occurred. During the break, the order was given to evacuate the building, which was already flooded with water and mud. UPDATE: More citizen photos and videos around the web. ← What could we have done to save Amy Winehouse?